As we discuss in the section Why under General we have published a scientific paper in May 2008 indicating that natural breeder reactors (georeactors) have been likely present in the Core Mantle Boundary from the early days of the solar system until maybe even today. Eventually direction sensitive antineutrino detection will reveal their present existence. In a paper we submitted at the end of October, we proposed that the Moon is not the result of a collision between a celestial body and the proto-Earth but rather formed after a run-away georeactor produced a large amount of heat in a short geological time that created a vapour bubble that finds its way through the (molten) mantle to the surface and “spits out” a bubble of mainly mantle material that forms the Moon. The figure below is taken from the article “Birth of the Moon” (see home page). An abstract has been submitted to the Lunar and Planetary Science Conference to be held in Houston, Texas at the end of March 2009. 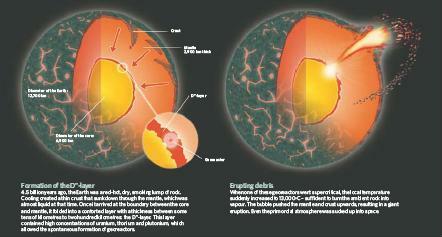 The abstract summarises the arguments for this hypothesis and shows its feasibility from the Earth-Moon dynamics. The abstract is placed in the download list of Scientific Papers on the home page of this website.